The magnitude response of the 5th order filter is shown in Figure 1, along with the response of the analog prototype. Figure 1. Magnitude response of N= 5 IIR Butterworth filter with fc = 10 Hz and fs = 100 Hz. The prototype analog filter’s response is also shown. For the 3rd order filter, with Ωc= 1 and fs= 2, the z-plane poles fall as shown in Figure 2. From equation 1, H(s) has 3 zeros at s= ∞. How do they map to the z plane? We will show later that the bilinear transform maps -∞ to ∞ on the jΩ axis to -fs/2 to fs/2 on the unit circle. So the 3 zeros of H(s) map to +/- fs/2 on the unit circle, which corresponds to z= -1. (Recall that on the unit circle, z= ejω, where ω = 2πf/fs. For f = +/-fs/2, we have ω = +/-π, so z = ejπ = -1). The three zeros are represented by the ‘o’ in figure 2. 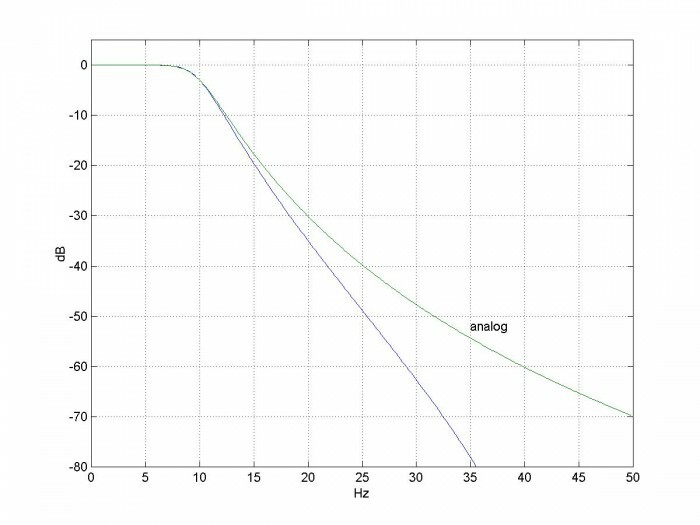 Looking again at Figure 1, you may have wondered why the attenuation of the IIR filter is greater than that of the analog filter as f approaches fs/2. The reason is that the analog filter’s zeros are at ∞, while the bilinear transform compresses the frequency scale so that the IIR filter’s zeros are at fs/2. Figure 2. Z-plane Poles and zeros of 3rd order IIR Butterworth filter with Ωc= 1 and fs= 2. Find the poles of the analog prototype filter with Ωc = 1 rad/s. Given the desired fc of the digital filter, find the corresponding analog frequency Fc. Scale the s-plane poles by 2πFc. Transform the poles from the s-plane to the z-plane. Add N zeros at z = -1. Convert poles and zeros to polynomials with coefficients an and bn. Now let’s look at the steps in detail. Note we’ll repeat a lot of the math we already presented above. 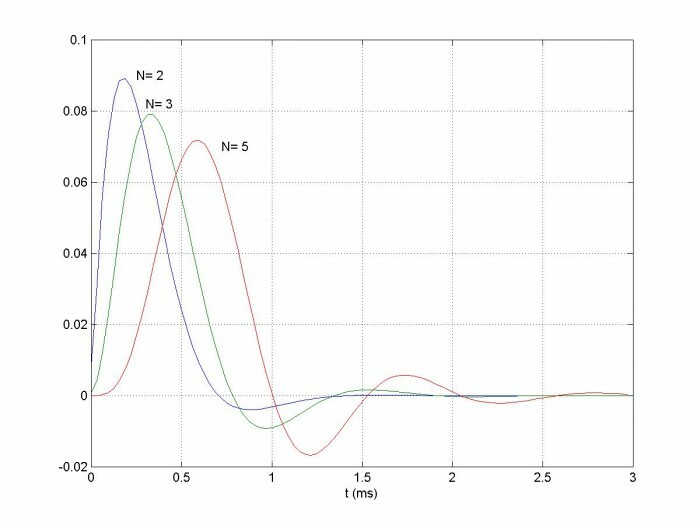 A Matlab function butter_synth that performs the filter synthesis is provided in the Appendix. It gives the same results as the built-in Matlab function butter(n,Wn) . This exercise is called frequency pre-warping. For example, if fs= 100 Hz and we want fc= 20 Hz, then Fc = 23.13 Hz. 3. Scale the s-plane poles by 2πFc. The poles obtained in step 1 gave Ωc = 1 rad/s (i.e. 1/(2π) Hz). Multiplying the poles by 2πFc scales the analog filter cut-off frequency to Fc and the digital filter cut-off frequency to fc. In butter_synth, we represent the N zeros as a vector q= -ones(1,N). So, for gain of 1 at ω= 0, we make $K=\sum a/\sum b$. And that's the last step. Figure 3 shows the frequency response vs. order N for filters synthesized by butter_synth. 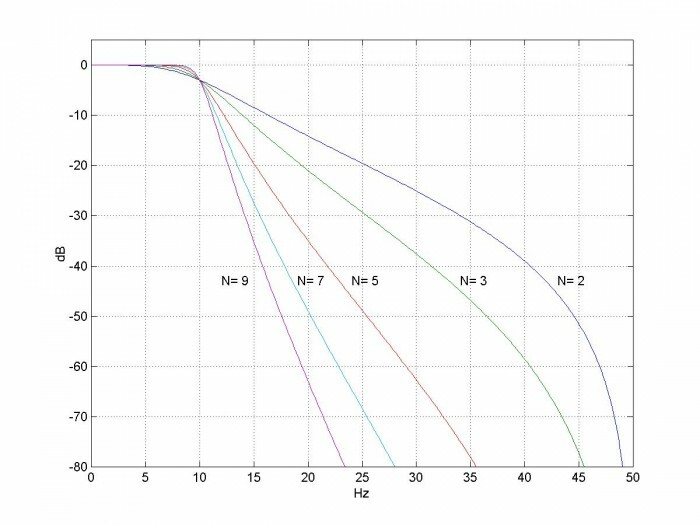 Figure 4 shows the impulse response vs. order N for three cases. Figure 3. IIR Butterworth magnitude responses for fc= 10 Hz and fs= 100 Hz. Figure 4. IIR Butterworth impulse responses for fc = 1 kHz and fs = 32 kHz. Figure 5 plots equation 8 for fs= 100 Hz. The entire analog frequency range maps to –fs/2 to fs/2. Also shown on the zoomed plot on the right is the transformation of discrete frequency f = 20 Hz to continuous frequency F = 23.13 Hz. Note that the frequency mapping is approximately linear for f < fs/10 or so. 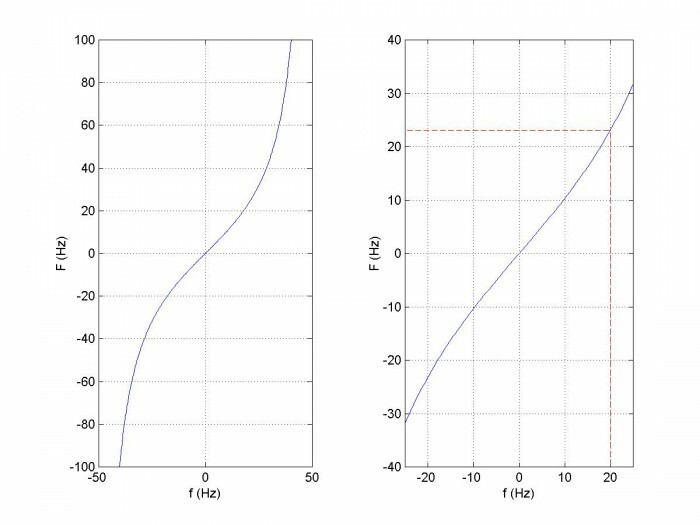 Figure 6 shows the effect of using equation 8 to pre-warp the cut-off frequency of an analog prototype filter to give fc = 20 Hz. With pre-warping, the analog prototype poles were scaled by 2π*23.13. Without pre-warping, they were scaled by 2π*20. Figure 5. Frequency mapping of the bilinear transform for fs = 100 Hz. x axis is discrete frequency and y-axis is continuous frequency. The right plot is a zoomed version of the left plot, showing the value of F for f = 20 Hz. Figure 6. 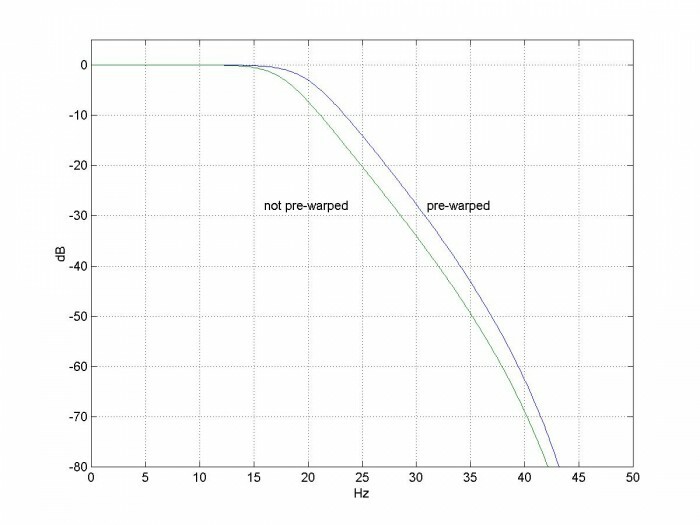 Effect of pre-warping for fc = 20 Hz and fs = 100 Hz. 5th order IIR Butterworth. This program is provided as-is without any guarantees or warranty. The author is not responsible for any damage or losses of any kind caused by the use or misuse of the program. You cleared up the internal secrets of Matlab function "butter" and I got identical results using either. Great job and very useful. Yes, I was pleasantly surprised when I ran the function and the results matched. So now only another 99.9% of Matlab is a black box. Clarity in your articles while dealing with fundamental concepts is great. You're welcome, I appreciate the feedback. 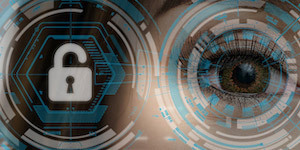 I request you to do one article like this on iir notch filter (if you have time). I'll put that on my list! 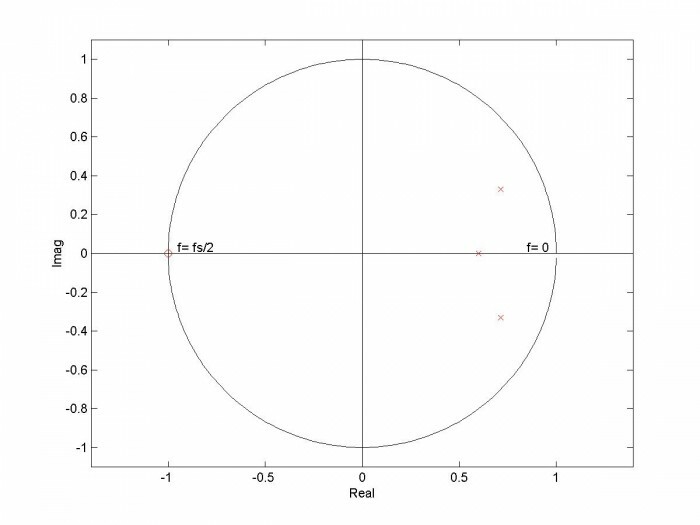 It seems going too low does not do well with Matlab, supprinsingly your code also does not work with such cut-off frequency, do you have any idea what might cause that? See my article on iir filter design using Cascaded biquads. It explains the problem you are having. All right it seems to be a solution although my filter is of order 2, and regardless the method (Biquad or Butter) I always end up having a gain K of 0 when summing my coefs "a". For the record I need a cut-off frequency at 2.365968869395443e-09. I guess the improved narrowband you talk about in another article will do the trick? I am about to give it a try. That is a really low cut-off frequency. What is your application? Note that you could use a decimator (e.g. CIC decimator) to reduce your sample rate and make the problem more tractable. The application is DC value extraction with lowest noise possible. It is means to be implemented on GS/s ADC at a low power requirement.